Wonderful machine I have a friend that cleans houses and she loves her so I bought one and I am very happy! I would highly recommend. The Shark Rotator Powered Lift-Away Speed upright vacuum is ideal for pet owners, featuring Anti-Allergen Complete Seal Technology and HEPA filtration system to trap allergens and dust. The versatile unit can clean under furniture, adjusts from carpet to hard flooring, and the LED light at the floor nozzle helps you see hidden debris while cleaning. This is the best vacuum I've EVER had! It's all the things the ads say and then some. SUPER easy to put together, just snap four things together and WALLA! it's done. Wonderful performance, super suction, looooong cord, fairly quiet, very maneuverable and also VERY ATTRACTIVE! Super easy to use and empty dust bin. This vacuum was obviously very well designed and well thought out. I really appreciate all thought that went into it. I now need to get the motor hauler to make it a "canister" so the motor can follow me around. THANK YOU SHARK for a real winner! I'm delighted! Our old "pet hair" vacuum went out without any sign that it was on its last leg... But we are Much Better for it... With just one use...this vacuum picked up more cat hair with ONE use than the other did in 2 years!! We had no idea what was in our carpets and what we were breathing in everyday.... Hands down one of the best purchases We have EVER made.... Love it!! Love this vacuum, it's strong enough to get the dog hair off the carpet and I love the switch to change from carpet to hardfloor . 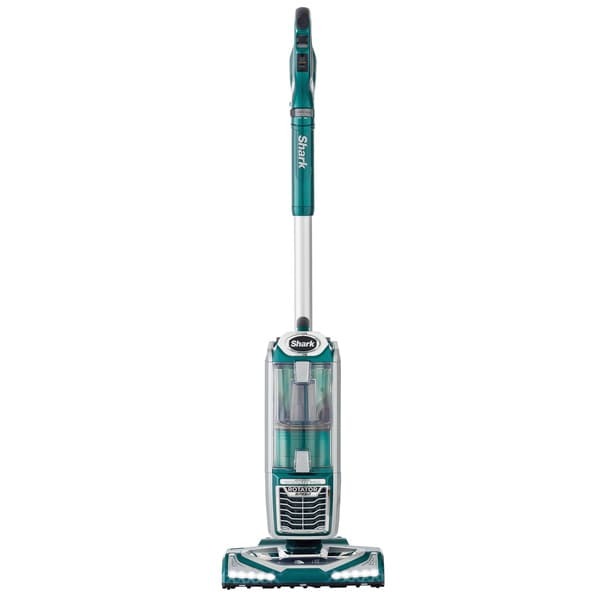 The Shark NV681 Rotator Powered Lift-away makes vacuuming easy. It's light enough that I can reach anywhere I need to. This vacuum cleans better than any other vacuum I have ever used. this is a great vacuum i would highly recommend this one. OK, just got this bad boy delivered today. Set up is quick and easy - no instructions needed (an NO I'm not a man lol, just can't get much easier than this). I purchased this to replace my Dyson, which I never really was a huge fan of, and what a difference. I only wish I'd changed to the Shark a very long time ago! Highly recommend. It is a bit heavier than the Dyson, but still no complaints, it works wonderfully and it was amazing how much this picked up (and yuck to how much was in my carpet). I'm a huge clean carpet/floor freak, so this is most definitely going to make my life so much easier. You won't be sorry if you purchase this. Can't believe how powerful this vacuum is. Picks up cat hair with no problem. I also have lots of tile so the hard floor feature also works great. Product arrived on time and was easy to track. Great vacuum at a great price! I use this everyday and could not be happier! I have 7 cats and 4 dogs but this keeps all their fur off my floor, carpet and furniture and it's not heavy to cart around! Love the carpet mode, really cleans carpets well. I have become a loyal customer to the Shark line of vacuums and have always wanted to try a Dyson but... The swivel on this vacuum and the reach with the wand is fabulous!!!! Love the light on the front and it does an amazing job! Would highly recommend!!! I bought this to use in our upstairs bedroom so I didn't always have to lug the other heavy duty vacuum, we've had for years, upstairs all the time. It works great, and is very thorough for removing dog hair. This is a very good vacuum cleaner. The swivel feature is a big help for getting to hard to reach areas. The only draw back is that it doesn’t pick up as well for older (less fluffier) carpet. I love Shark vacuums but this one was a little small for our family. It works great but I have to empty it way too many times. I highly recommend Shark but needed a larger one. I would not recommend, this lasted 1 year, motor burned up.. Just me in my house, loved the way it handled lightweight. Loved the way it came apart so easy, made cleaning fun.Loved so much I bought my daughter one, hers is still working. This is by far the best suction on a vacuum I have ever experienced. Would definitely recommend Shark. I love them. But as other viewers commented, the hose does detach quite easily with the snap ball feature to hold it to the wand. Poor design. But despite that, I still live it! heard nothing but good things about it.